A total of 24 camps and programs are scheduled this summer at Piedmont Technical College. 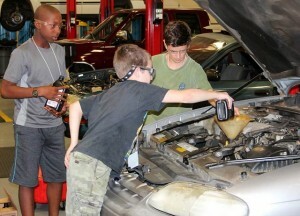 Students can choose from a variety of art, science, career-oriented or self-image improvement camps such as the annual Automotive Technology camp, pictured. Young people looking for something different, fun and exciting to do this summer will find several options available from Piedmont Technical College. A variety of educational as well as entertaining camps and programs will be offered for kids of all ages. Students ages 11-18 who want to participate in an educational experience can choose from summer programs ranging from engineering to automotive, agriculture to criminal justice. Summer programs students can attend are: Discovering the World of Mechatronics and Robotics, June 8-12 and June 15-19 at the Center for Advanced Manufacturing in Laurens and June 22-26 at the Newberry County campus; Science Technology, June 22-26; Criminal Justice Youth Program, June 22-25; Exploring the Power of Electronics, July 20-23; Robotic Engineering 101, July 20-23; Girls Achieving in Technology and Engineering (G. A. T. E.), July 13-16; The Art of Pottery, June 22-25 at the Edgefield County campus; Discovering Nature through Agriculture, June 22-25 at the Saluda County campus; Automotive Technology, June 22-26; and DigiTech, June 15-19. The registration deadline for the Science Technology, G.A.T.E., Discovering Nature through Agriculture and Automotive Technology is June 2 and participants must have a letter of recommendation from the student’s guidance counselor. For kids ages 6-13, summer camp opportunities are available that combine creativity and imagination into an engaging experience. Those camps are Tiny Princess Camp, June 8-11; Prince Charming Camp, June 22-25; Princess Camp, June 15-18 at the Abbeville campus and July 13-16 at the Greenwood campus; From Prince to King, July 6-9; Adventures in Flight, June 15-18; Junior Dessert Designer, July 6-9; and Junior Survival Camp, June 8-11 at the McCormick County campus and July 27-30 at the Greenwood campus. A new and exciting series of gaming summer programs will also be offered for kids ages 8-14. In partnership with Black Rocket, these programs will introduce participants to the world of creative sciences and digital arts. Each course emphasizes self-empowerment, cognitive reasoning and divergent thinking through hands-on learning. Programs include Make Your First Video Game, June 15-19; App Attack, June 22-26; Lego Games, July 6-10; Minecraft Designers, July 13-17; App Adventures: The Next Level, July 20-24; Video Game Animation, July 27-31 at the Newberry County campus; Minecraft Modders, Aug. 3-7 at the Laurens County campus; and Make Your First 3D Video Game, Aug. 10-14. All programs will be held at the Greenwood campus unless otherwise noted. For more information on all of the camp opportunities and to register, contact Vickie Baldwin at (864) 941-8602 or go to www.ptc.edu/camps.